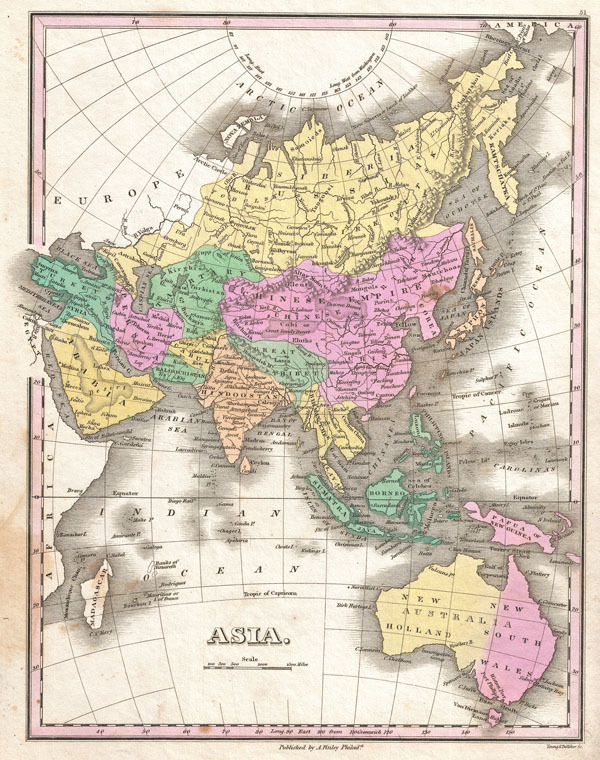 A beautiful example of Finley's important 1827 map of Asia. Depicts from the Black Sea and Arabia eastward to the Behring Strait and Papua New Guinea. Includes Australia (New Holland) and the East India Islands with Asia, as was common in this period. The Land of Liakhov, more widely known as the Legendary Ivory Islands, appear in the Russian Arctic. Ivan Liakhov discovered these islands in the late 18th century and was astounded to find that they contained so much fossil mammoth ivory that the entire archipelago seemed to be composed of the stuff. Engraved by Young and Delleker for the 1827 edition of Anthony Finley's General Atlas. Very good condition. Light soiling lower left quadrant. Original pressmark. Blank on verso. Rumsey 0285.052 (1831 edition). Phillips (Atlases) 4314, 760, 752, 6045.